While announcing its proposal for 10% general category reservation for economically poor upper castes, representatives of the government said that the reservation would apply to all groups not covered by existing quotas, including Muslims and other religious minorities. 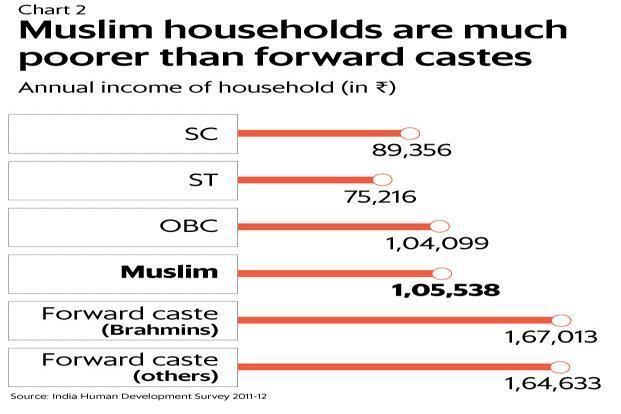 Though the move is being sold as a pre-election sop for upper castes, data shows that if the government seeks out the poorest of the eligible poor, the quota should almost entirely go to Muslims. However, the eligibility criteria have been made overly broad, meaning that nearly everyone in the country will be eligible. The Narendra Modi government has said that it intends for the eligibility cut-off to be a household income of ₹8 lakh per year. Families owning agricultural land above five acres, a house above 1,000 sq. ft, or a 100 yard plot or above in a notified municipal area or a plot of 200 sq. yards or above in a non-notified municipal area will not be eligible. 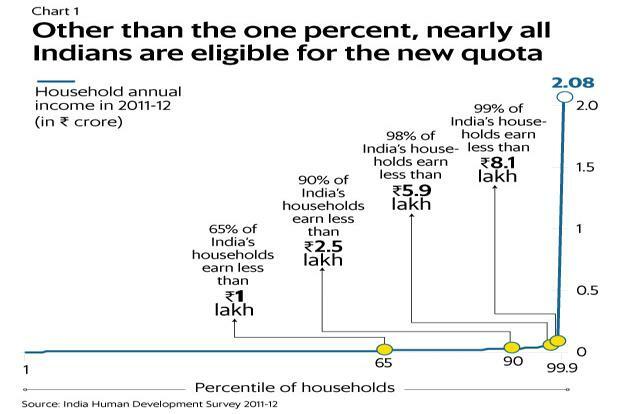 On average, a little over the top 1% of the country has a household income of over ₹8 lakh, according to data from the 2011-12 India Human Development Survey (IHDS) conducted jointly by the National Council for Applied Economic Research and the University of Maryland. But among groups that are not currently covered by reservations, Muslims undoubtedly stand out as the poorest. The average Indian annual household income was ₹1.13 lakh as of 2011-12, with scheduled castes and scheduled tribes earning the least, followed by Muslims and then other backward classes (OBCs). Upper castes are the richest, with a household income nearly one-and-a-half times the Indian average. Also, as of 2011-12, less than 3% of rural households owned over five acres of land, and the proportion is just 1% among Muslims, according to data from the National Sample Survey Office. 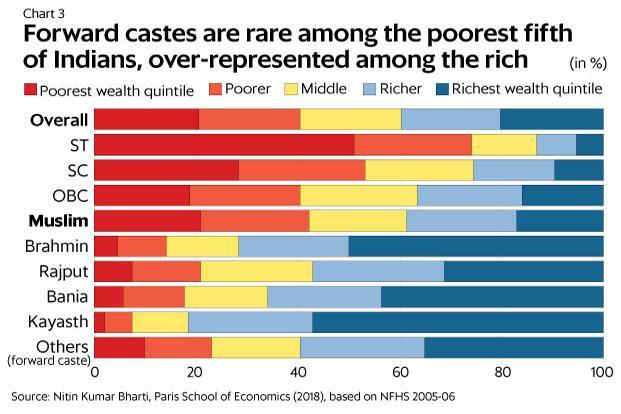 Using a wealth index from the National Family Health Survey (NFHS), Nitin Kumar Bharti, a doctoral student at the Paris School of Economics, found that as of 2005-06, along with backward castes, Muslims formed a substantial share of the poorest one-fifth of Indians, while forward castes were rare in this group. 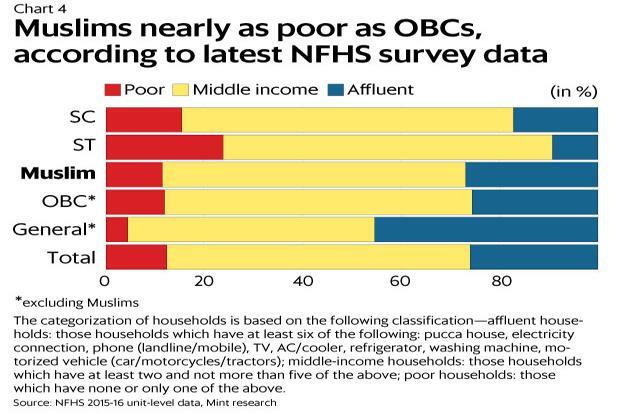 A Mint analysis of NFHS 2015-16 data found that even ten years later, Muslims are under-represented among the affluent while forward castes are over-represented. In terms of affluence, Muslims were found to be on par with OBCs but in terms of higher educational attainments, Muslims lagged behind OBCs. Moreover, things are getting worse for Muslims, likely as a result of a lack of quotas. 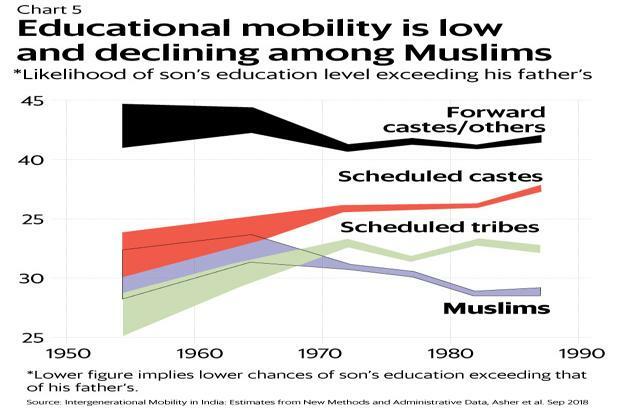 Since the mid-1950s, intergenerational mobility—the opportunity for a boy to do better in life than his father—has improved for scheduled castes and scheduled tribes, but fallen for Muslims. The economists Sam Asher, Paul Novosad, and Charlie Rafkin of the World Bank, Dartmouth and MIT respectively used educational outcomes as a proxy for overall mobility and found that the expected educational rank of a Muslim child has fallen substantially over the last 20 years and intergenerational mobility is now considerably worse among Muslims than among SCs and STs. “Higher caste groups have experienced constant and high upward mobility over time, a result that contradicts a popular notion that it is increasingly difficult for higher caste Hindus to get ahead,” the authors wrote. There is evidence to suggest that quotas can improve educational outcomes. Guilhem Cassan, an economist at the University of Namur in Belgium, took advantage of a natural experiment which occurred in 1976, when the lists of SCs were harmonized across states for the first time since Independence, giving fresh SC status to 250,000 people. Cassan compared the educational levels of those people who had SC status since Independence, and those who were of school-going age when they got SC status in 1976, and found that access to the SC status led to an improvement in years of schooling, literacy and numeracy levels. By creating an over-broad eligibility criteria, the Modi government has opened up the proposed new quota to virtually all Indians not currently covered by reservations—half of the country in all. Their backwardness should ensure that Muslims have first claim to any new affirmative action. But if they have to compete with forward caste Hindus for a small share of reserved college spots and jobs, Muslims might find themselves the last to be picked. Will classical cyclicality risks pull back CV growth rate?